Made with 40.2% delicious sun dried tomatoes, fresh Ligurian basil, Grana Padano cheese, cashew nuts and Filippo Berio Extra Virgin Olive Oil. Simply stir our sundried tomato pesto into pasta for a convenient and delicious meal. Or why not top with grated cheese and grill for a richer flavour? 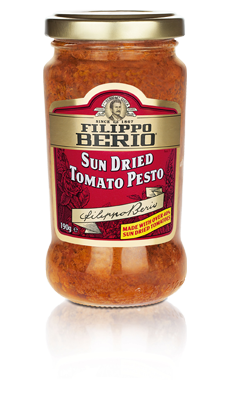 You can also use Filippo Berio Sundried Tomato Pesto to add flavour to jacket potatoes and sandwiches, on bruschetta and to add zing to soups, gravy and casseroles.